Effortless beauty meets classic style with our Screen Siren Lace Gown. Designed with all-over stretch, this elegant fit and flare long gown will flatter and accentuate your beautiful curves. A ruched waistband in a contrasting fabric pulls the eye inward to the smallest part of your body and a scalloped neckline and sleeves add that special detailing. 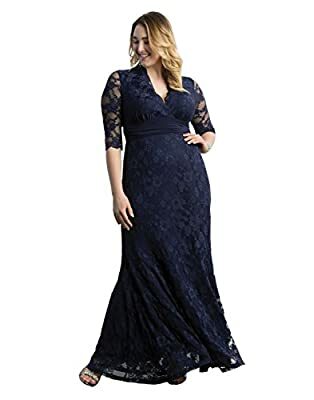 Designed exclusively in plus sizes, this gown is perfect for wedding guests, mother of the bride, bridesmaids, balls, and every other formal evening special occasion. Lace: 75% Stretch Nylon, 25% Rayon; Contrast & Lining: 95% Polyester, 5% Spandex. Dry clean only and do not steam, warm iron can be used when needed. Made with love in the U.S.A. This is an authentic Kiyonna garment with accurate plus size fit. Please note that Kiyonna is the only authorized seller of the Kiyonna brand on Amazon and that similar knockoffs exist but don't carry the exclusive Kiyonna logo, precise plus size measurements, or a quality fabric guarantee. All Kiyonna garments hold the highest quality standards and are 100% made in the USA.